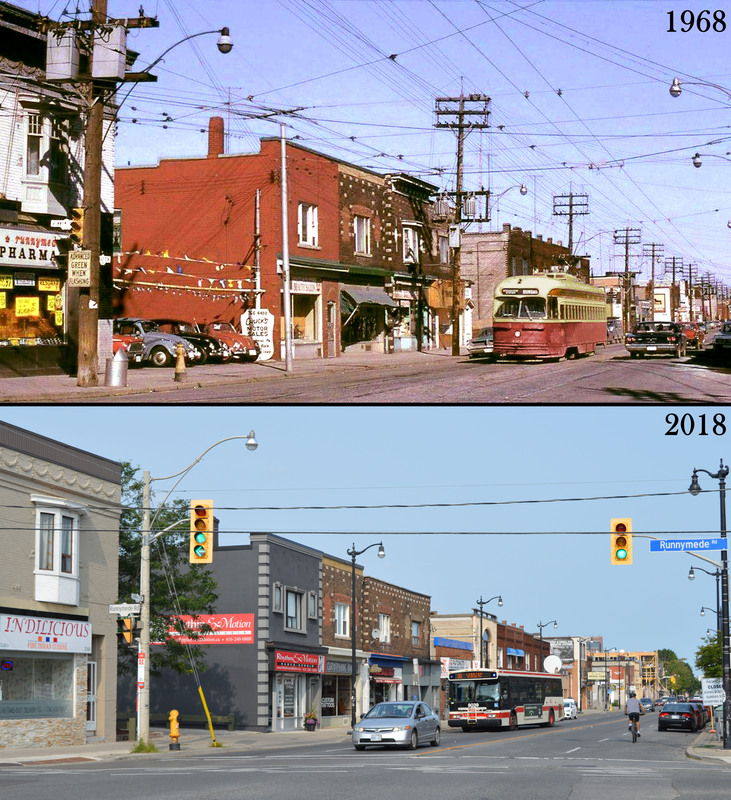 Dundas Street West and Keele Street facing west, 1965 and 2018. 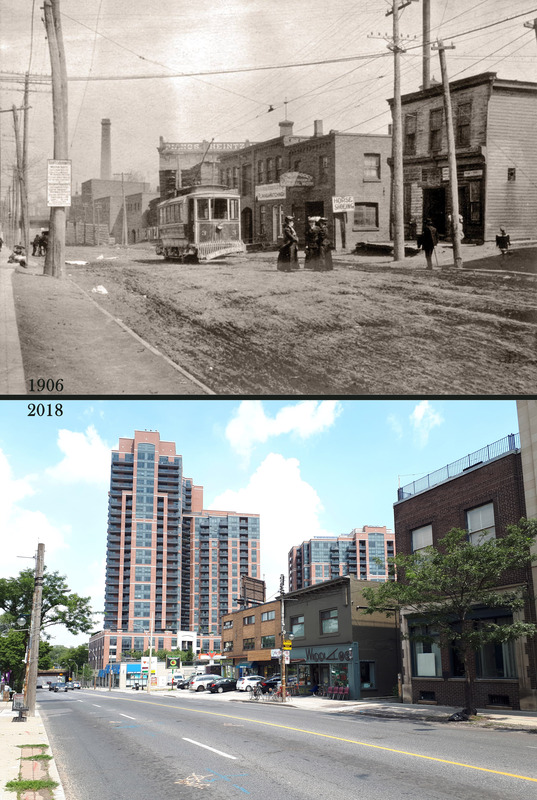 Dundas Street West and Keele Street, facing west: 1908 and 2018. 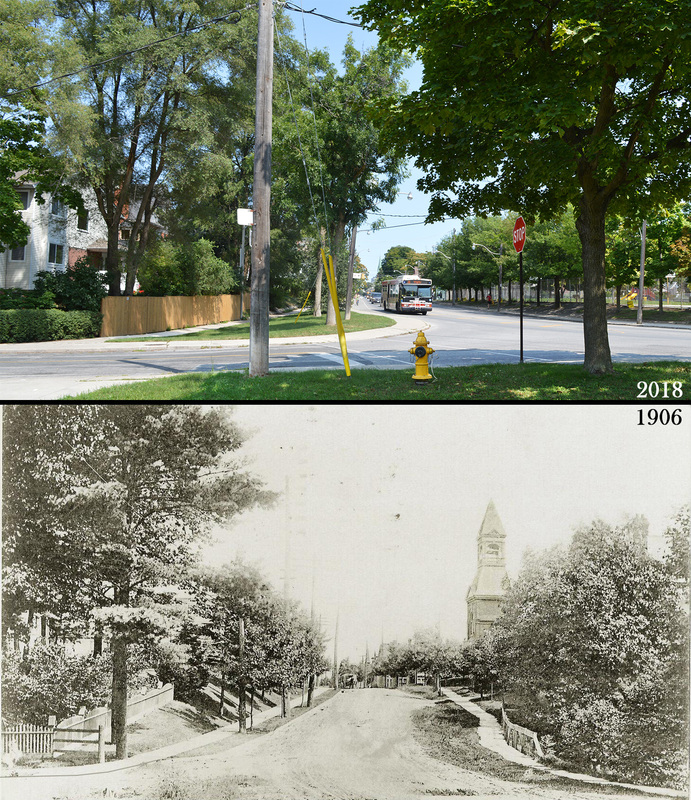 Keele Street facing north from Dundas Street West, 1906 and 2018. Annette Street and Laws Street, facing east to Clendenan Ave, 1906 and 2018. 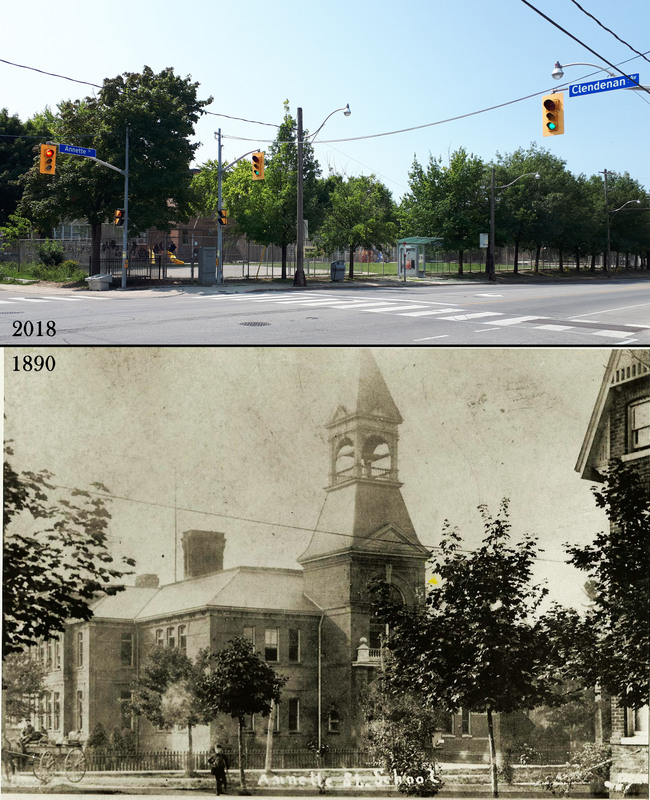 Annette Street facing south-west past Laws Street to St. Cecilia’s Catholic School, 1935 and 2018.
ca 1886-8 designed by John Anthony. 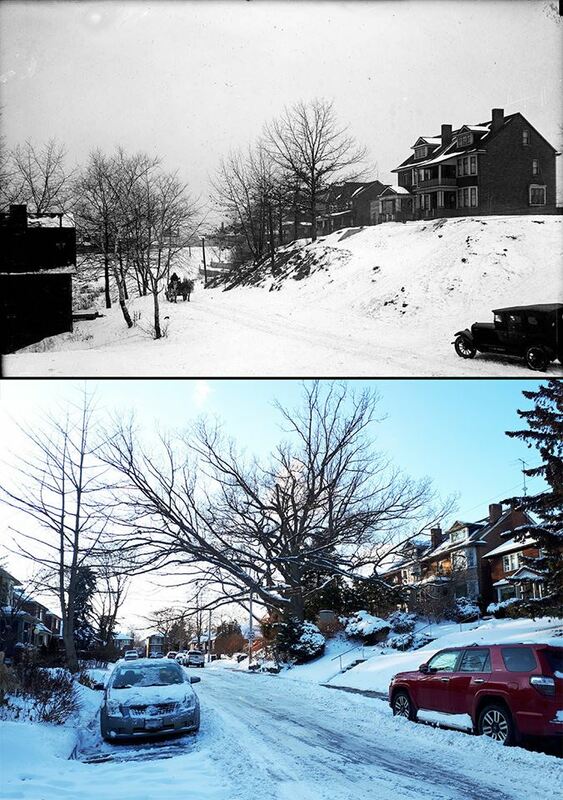 Abbott Ave. facing west towards Indian Road Crescent, 1925 and 2017.The house on the hill is still there, but the one in the valley is gone. The area has been graded with landfill. 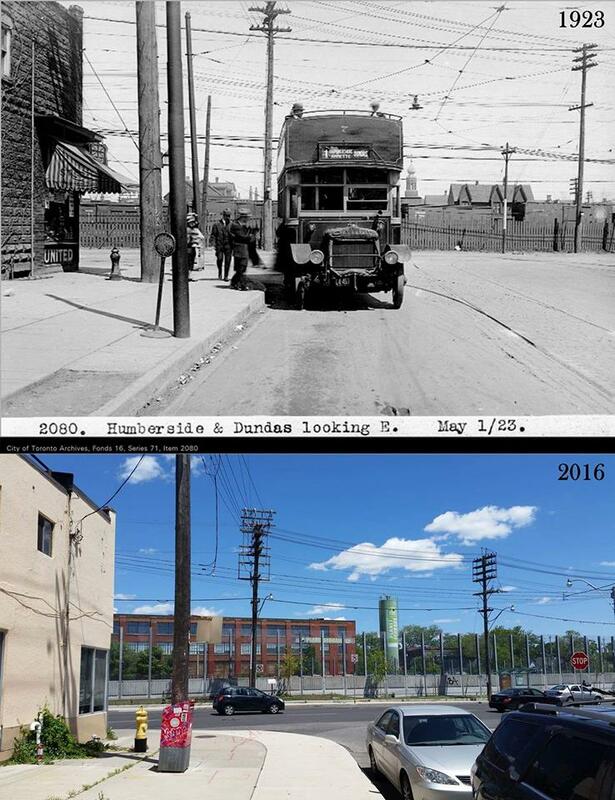 Humberside Ave. looking east to Dundas Street West, 1923 and 2016. South-west corner of Pacific Ave. and Vine Ave. 1953 and 2016. 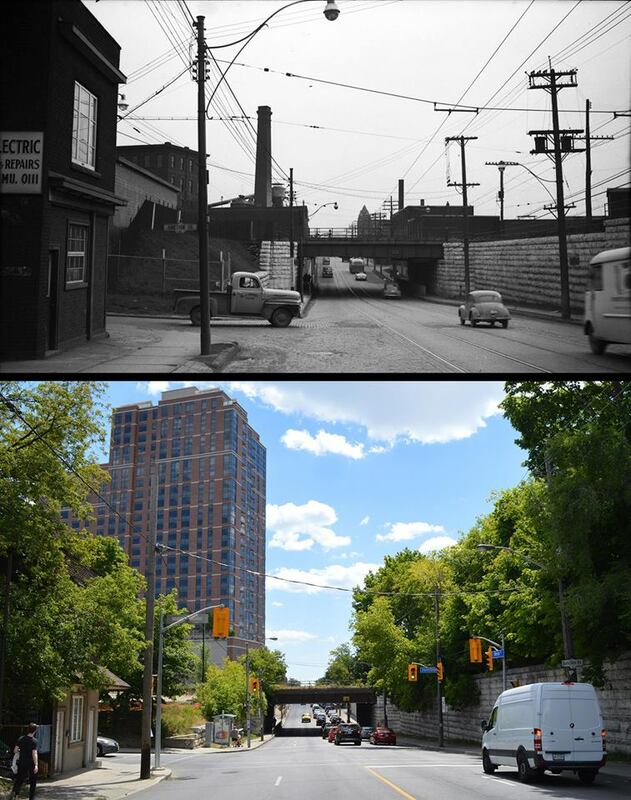 Bloor Street West on the east side of High Park Ave. facing north, 1966 and 2018. 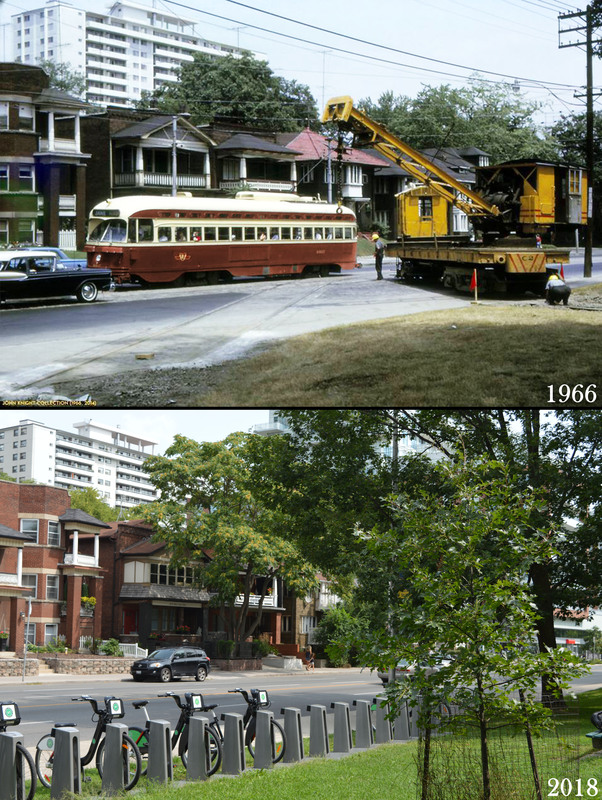 In 1966 the yellow crane could be seen removing the loop, 2 years before the Bloor streetcars were removed as well. Today there is an open grassy area and Bike Share Toronto where the loop once was. 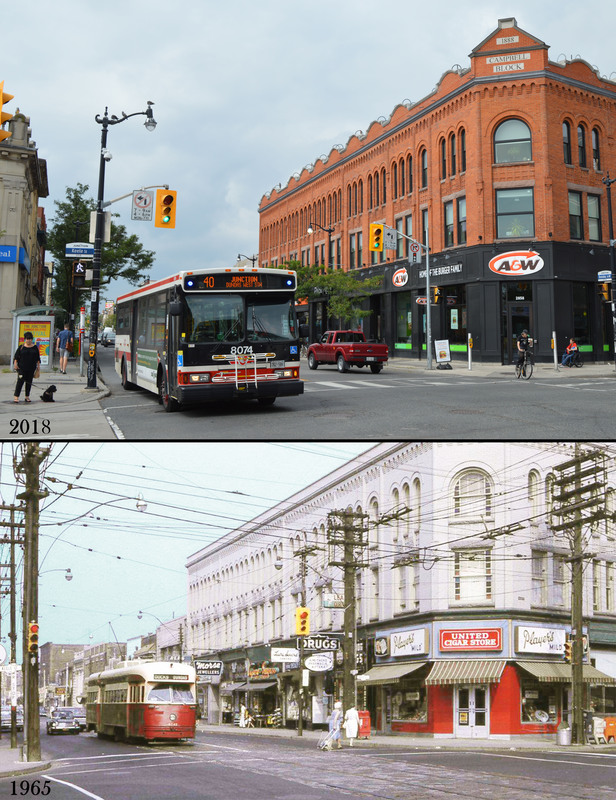 Bloor Street West facing east to Dundas Street West, 1967 and 2018. 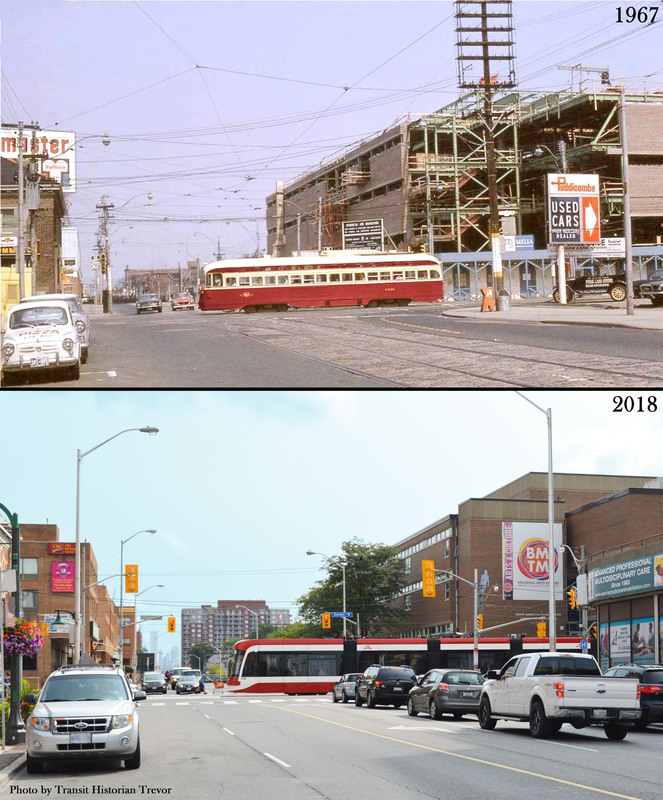 Dundas Street West and Runnymede Road facing east, 1968 and 2018. 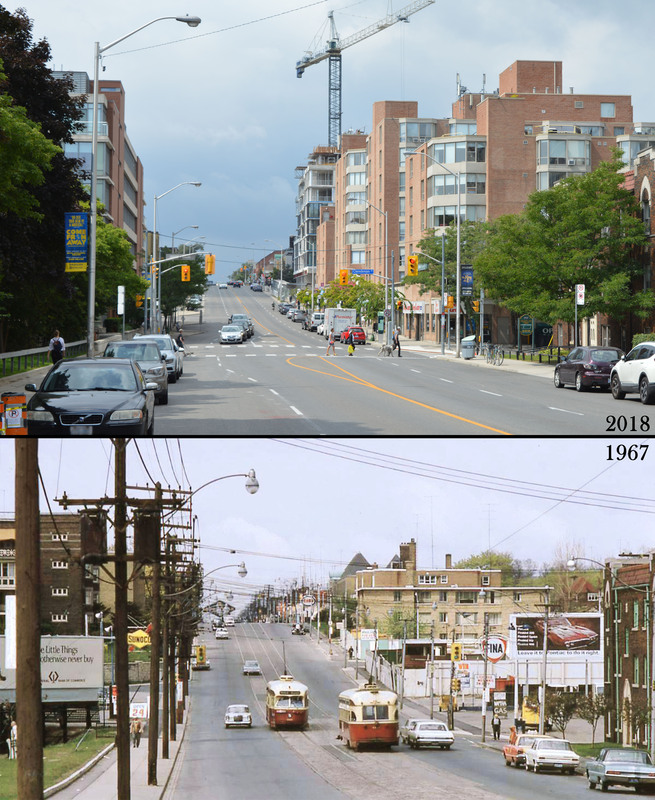 Bloor Street West facing west to Clendenan Ave, 1967 and 2018. Bloor Street West and Keele Street facing east, 1967 and 2018. 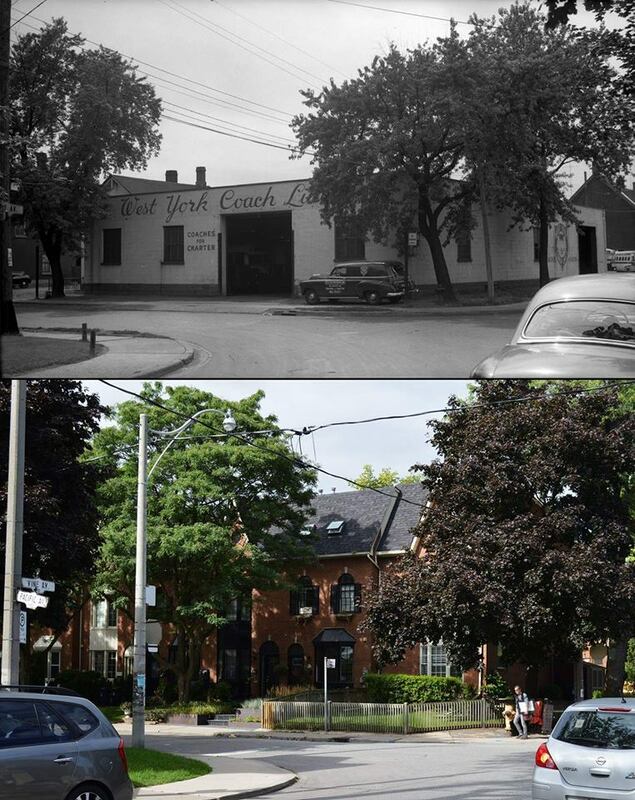 The northeast corner of Bloor Street West and Keele Street, 1962 and 2018. Bloor Street West, facing east to Clendenan Ave. 2018 and 1909. 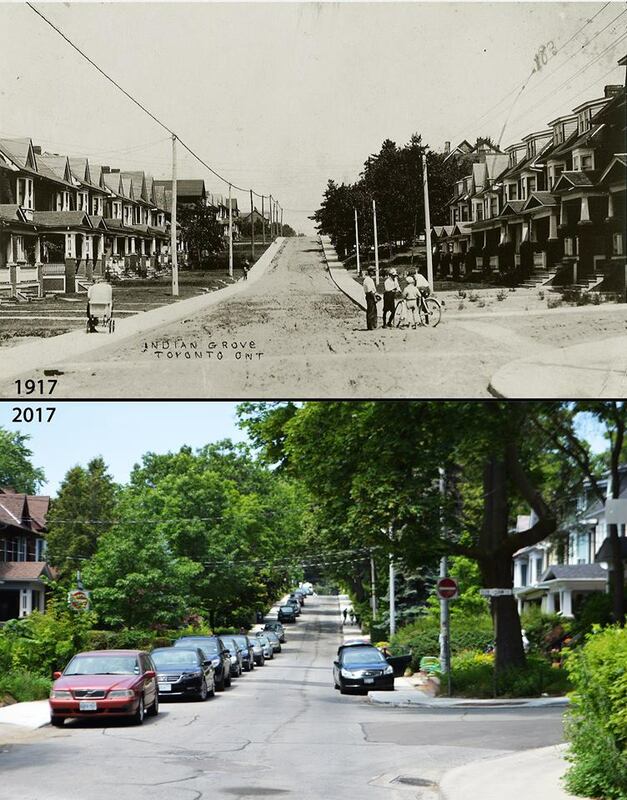 Bloor Street West facing east to Clendenan Ave., 1914 and 2018. 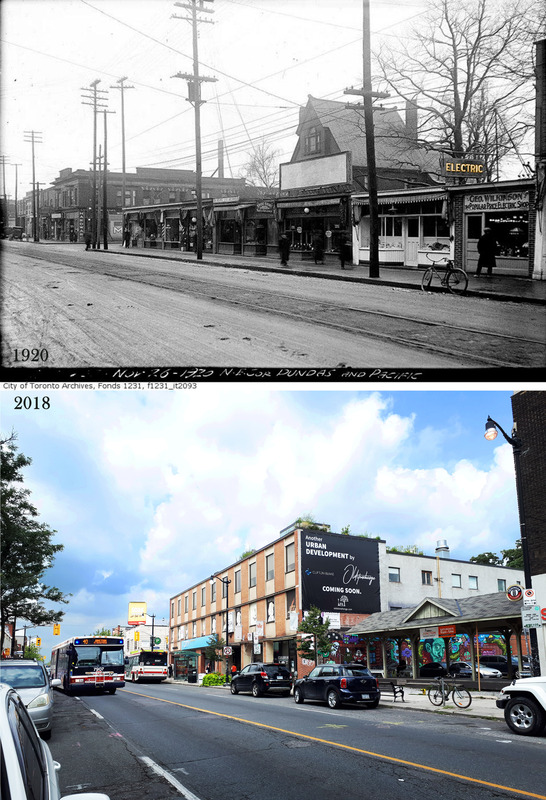 Dundas Street West facing west to Pacific Ave., 1920 and 2018. 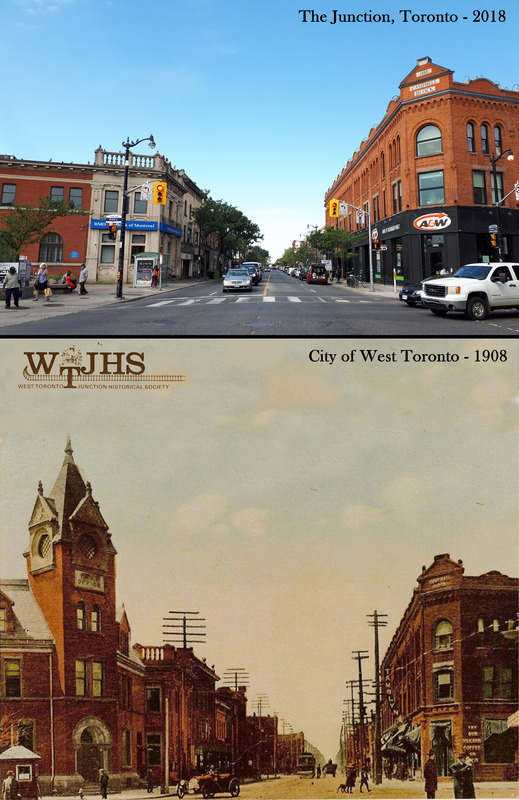 West Toronto Junction Historical Society Published by Trevor PS · August 15 at 7:23 AM · The northeast corner of Pacific Ave. and Dundas Street West, 1890 and 2018. The Third Church of Christ Scientist was built in 1928 at 70 High Park Ave, just north of Bloor Street West. It was designed by Toronto Architect Murray Brown in a simplified Classical style. The Church was suffering from a low congregation and lack of maintenance funds, so the property was sold to a condo developer in 2003, who agreed to retain all of the original within the new structure. 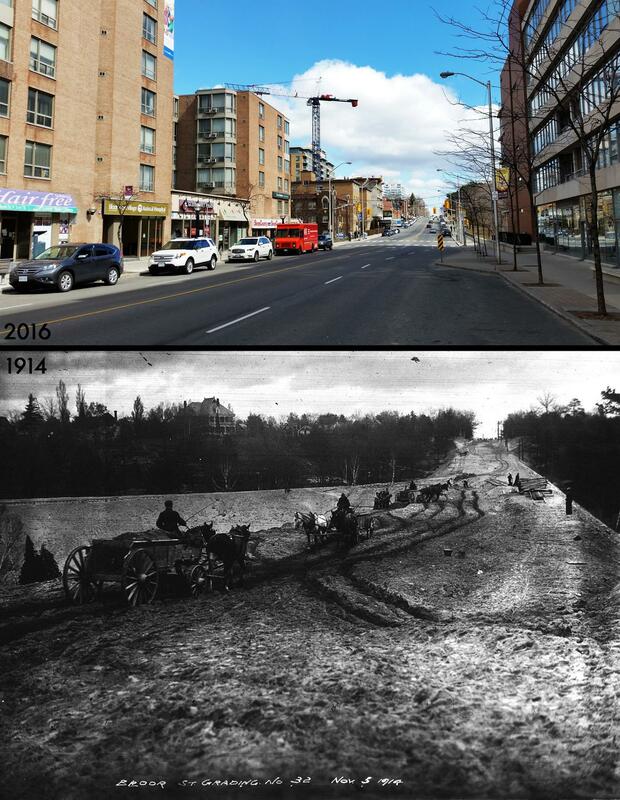 Bloor Street West facing east to Clendenan Ave. 1914 & 2016. Bloor Street W. facing west past Indian Grove towards Keele Street, 1921 and 2017. Prior to the founding of the TTC, the city ran “Toronto Civic Railway” streetcars in newly annexed areas of the city. “Birney” cars operated on Bloor West between Runnymede Road and Dundas St. West, where riders could transfer to the Toronto Railway Company streetcars. High park is in the background. 2017 photo taken by WTJHS member and Transit Historian Trevor of Transit Bricks. 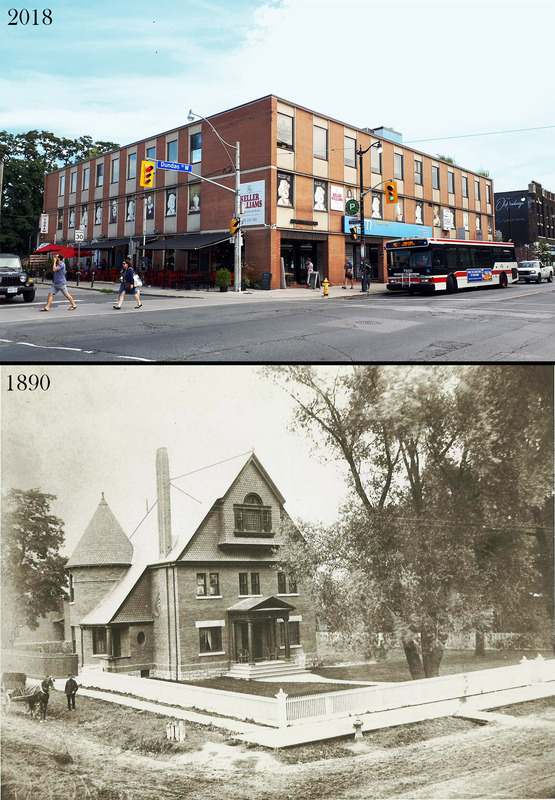 The High Park Sanitarium (32 Gothic Ave.) viewed from downhill near Bloor Street, 1920s and 2016. Indian Grove, facing north past Glen Gorden Road. In 1917 the road was still dirt, but in 2017 there are way more trees. Dundas S. West and Bloor St. West facing west, 1915 & 2017. Bloor Street West, facing east from Glendonwynne Road towards High Park in the distance. 1906 and 2017. 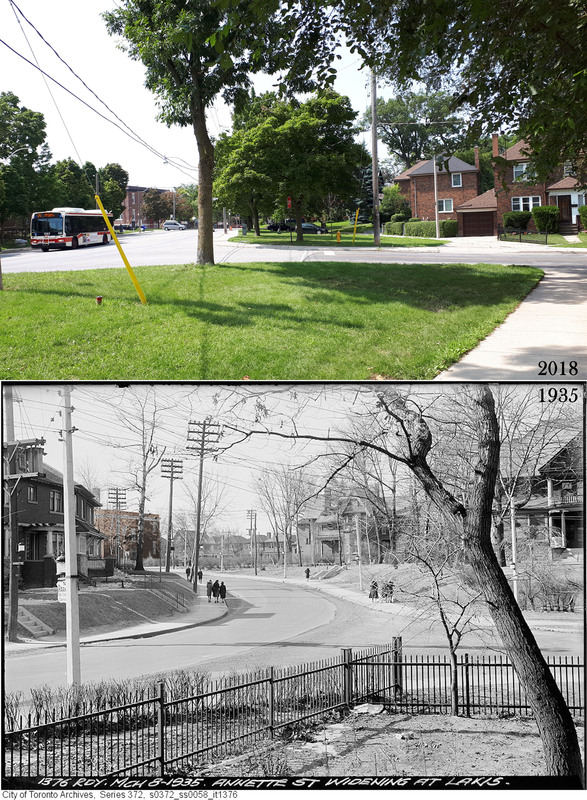 Bloor Street West and High Park, facing west to Clendenan Ave. 1914 & 2015. Bloor Street facing east to Keele Street. 1966 and 2017. The streetcar line from Keele to Jane Stations was removed when the Bloor-Danforth Subway extension was opened. Keele Subway Station, 1960s concept art vs. 2016 Google Earth view. Runnymede Road & St. Clair Ave., facing south-west. Runnymede Roundhouse (1957), now BMO & Walmart (2016). North-west corner of Annette Street and Keele Street, 1974 and 2017. 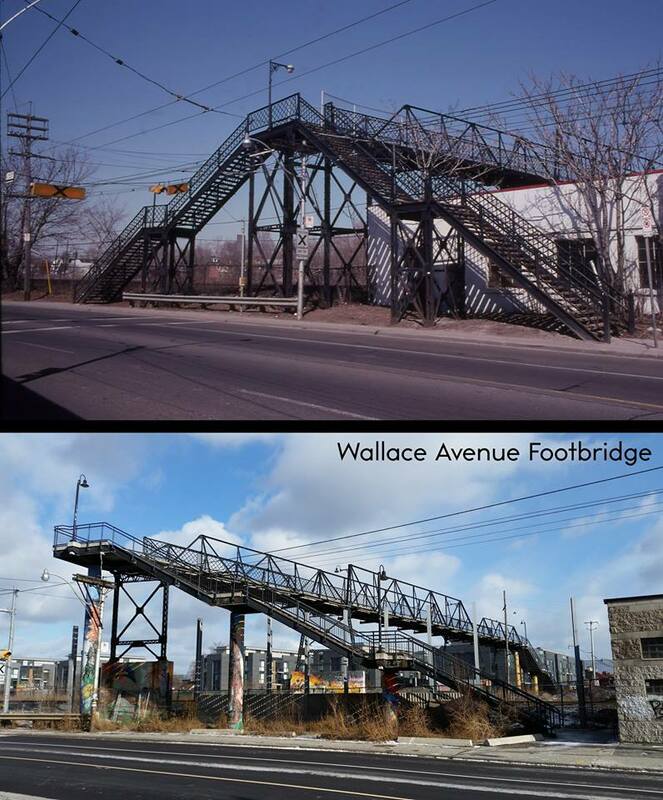 Wallace Ave. Footbridge. New and Old. Facing east from Dundas Street West. Original bridge built 1907.